For the last 6 weeks we underwent bride and groom Gladiator training under the wise tutelage of Tanzia and Jared at Fitness Artist. Having done some pretty brutal workouts in my day, I’ll be honest, I was talking a little bit of trash to Ms. Rowe when we were driving to our 1st lesson. I told Chenique “I hope they don’t hand me some pink dumbbells or purple resistance bands”. Capital Region let me tell you, I was crawling out of almost every 45 minute session. I don’t know about you, but I always get a better workout in when someone is telling me what to do and I can just focus on the work. We started by taking measurements. They provided a full service fitness package, not just helping us monitor our diet. This was helpful in giving us a starting point. Making us more aware of our everyday behaviors as we move forward in realizing out fitness goals. We learned the true impact of nutrition when it comes to making lasting changes and meeting fitness goals. Training at Fitness Artist, we learned one of the greatest benefits of a personal trainer is keeping you honest, on task and with high intensity. When our muscles were burning and we may have had a tendency to take it down a notch, our trainer was there cheering us on and keeping us moving. Using a timer to enhance productivity, and always being mindful of the clock, serves you well in every task, ESPECIALLY the gym. We were able to get a brutal workout in at their Clifton Park facility with Adam, one of their Head Trainers. I’m surprised we didn’t crawl out of the gym! We got the opportunity to attend a couple of exclusive group classes as well. The classes were amazing and still had that individualized personal training feel! Tanzia and Jared are both very passionate and extremely knowledgeable personal trainers. They are both an encyclopedia of exercises, and no workout was the same. 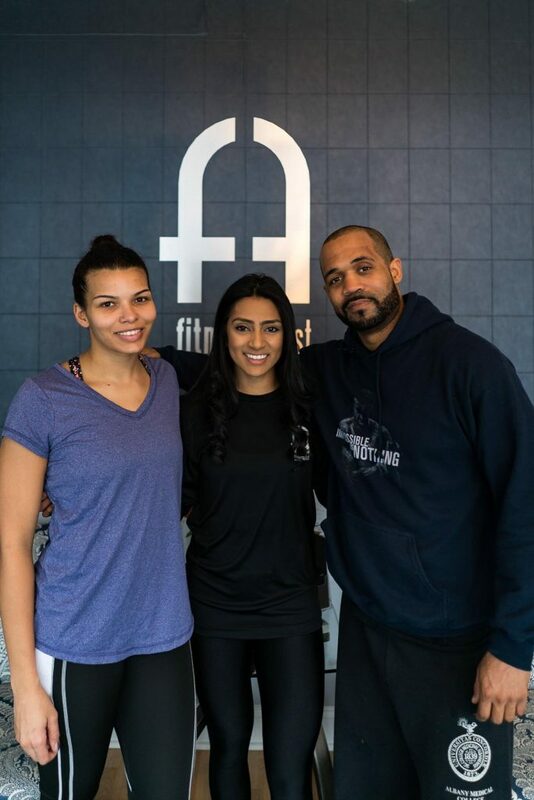 Neither of us find joy in running and typically get our cardio from practicing Brazilian Jiu Jitsu or heavy bag work, Tanzia and Jared did such a great job incorporating cardio into complex strength based exercises that really got the heart pumping while building muscle. We’d highly recommend The Fitness Artist! Everyone we came across was friendly and knowledgeable! Now that we’ve completed our Sculpted Bride package, we plan to keep the momentum up in incorporating our newfound awareness about our nutrition and the techniques that we learned to continue forward in meeting our goals as we approach the big day and beyond.